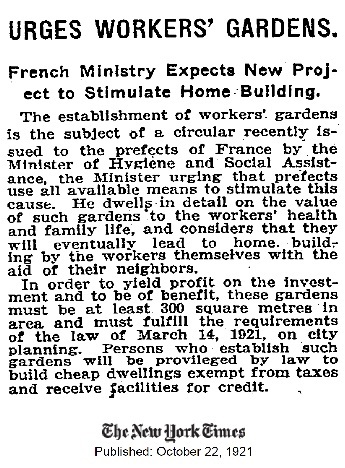 Contrary to the assumption in the 1921 French version of workers’ gardens, which was adopted by the conservative right wing national Bloc government, sometimes no profit may be yielded yet significant material benefits may be realized by desperate people living now or in the future. Many cannot afford to purchase sufficient nourishing food. But with some version of workers’ gardens, they might be able to become somewhat less dependent upon expensive food commodities and supplement their diets with nutritious produce from small productive plots, container gardens, or fruit trees. I want to state plainly at the outset that I have come to believe, both as a soil scientist and as a socialist, that, where climate and other natural conditions will permit it, workers’ gardens in some form need to be made available to everyone. Workers’ gardens at the very least would allow humans living in crowded settings to produce some good and needed food, and to provide some mutual aid in society’s restoration of its lost nutrient balance. The demand for workers’ gardens could easily be part of, and not undercut, the broader demand for justice. This technical report is focused on nutrient scarcity in relation to soil, not on the physical scarcity of soil per se, much less on social problems per se. I am primarily trying to give the reader the plain substance in terms of soil chemistry. I point out major problems with nutrient scarcity and soil that must be dealt with by humanity over time. I even say in general terms what has to happen. However, the precise forms of solutions to the nutrient scarcity problems will need to be more fully developed over time and to be appropriate for each place in the best possible manner. Nonetheless, I do feel comfortable stating that, for reasons that include, but are not limited to, soil chemistry, all places where people live, including packed urban areas, should provide proximately-located spaces for all humans to participate in growing at least some of their own food. This should be a central organizing principal for urban planners, and existing communities should be retrofitted to meet this need as much as possible. The forms for workers’ gardens need to be democratically-determined and should vary from place to place. In most suburban settings the workers’ gardens would be perfectly fine in the private yards of the suburban occupants. This would make a much better use of precious terrain than decorative plants. In that case, the societal cooperation rendered might simply be indirect: by living partly off the food “grid,” expenditures of energy and agribusiness inputs could be lessened, water could be conserved, and nutrients could be recycled locally. However, it could be direct too: to sustainably grow a surplus of food in sterile suburbia and then share the surplus could be a compassionate thing to do and a quiet act of solidarity.